Why is the license server upgrade highly recommended for the Tekla 2018 version products? The Tekla 2018 product versions and the latest version of the Tekla Structural License Service 2.04, include Sentinel RMS version 9.2.1 which is fully compatible with Windows 10. It has always been our recommendation that the latest version of the Tekla Structural License Service is deployed when upgrading your client software but this version fixes a known issue related to commuting introduced in the previous version. When will Tekla Structural License Service 2.04 been available? Version 2.04 is availble now on the Tekla Download Service. Can I activate my 2018 upgrade PAKs before upgrading the Tekla Structural License Service on my license server? Yes - you can activate your 2018 PAKs as soon as you receive them and this is what we recommend. Will I need to reactivate my old PAKS once I upgrade the Tekla Structural License Service on my license server? No - they should continue to work before and after you upgrade the Tekla Structural License Service on your license server. What version of the Tekla Structural License Service do I need on my server to be able to install Tekla 2018 products on my clients? You need to ensure your license server is running Tekla Structural License Service 2.04, include Sentinel RMS version 9.2.1 available from Feb 2018 via the Tekla Download Service. What is meant by a client machine? A client machine is a PC where the software is installed and run by the engineer (user). I want to install the Tekla 2018 product versions on my client machine how do I know it’s safe to do so? On your client machine, are you using a server licence for any version of either Tekla Tedds or Tekla Structural Designer? Yes - Has your license server been upgraded to the latest version? see How do I know if the Tekla Structural License Service on my license server has been upgrade? How do I know if the Tekla Structural License Service on my license server has been upgrade? 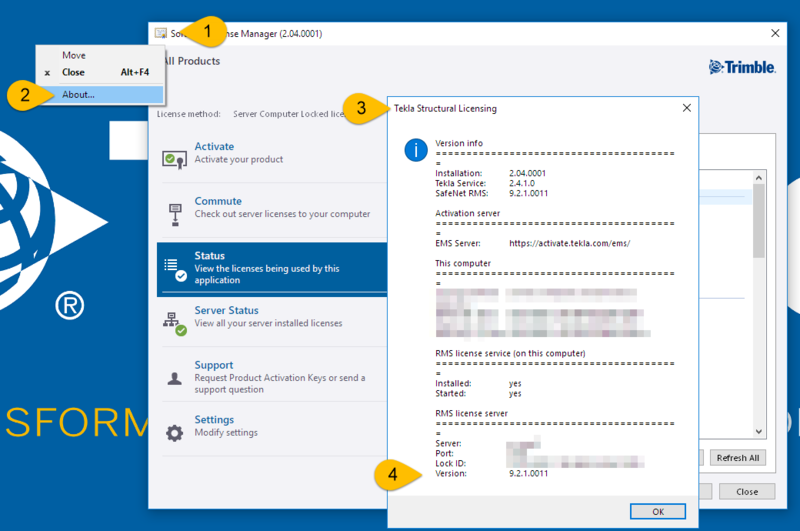 On your client machine launch the License Server Manager and from the System menu select About. If I have a server license and I run older versions of Tekla Tedds or Tekla Structural Designer on the same client and install the 2018 versions, will the older versions still continue to work if I do not upgrade my license server? No - Tekla Tedds or Tekla Structural Designer uses a common set of licensing components so installing 2018 will force any older applications on the client machine to use the latest version and therefore all versions may stop working if the server is not upgraded. If I’ve installed software using server and local licensing on the same client and I upgrade the software using the local licence do I still need to upgrade the server? Yes - the client side uses a common set of licensing components and therefore if you upgrade the software using a local license the software using a server license will be affected. If I’ve installed a 2018 version on my client but am unable to update the server at this point how do I rollback my client? The rollback involves uninstalling the 2018 version and all of it’s components and then reinstalling the version you had previously. Can I run multiple versions of Sentinel RMS License Manager service on the same server? No, a server cannot run multiple versions of the Sentinel RMS License Manager service. The Sentinel RMS License Manager installer has a known limitation in that it just over installs the already installed version. The version that is running is generally the version corresponding to the most recently run installation. You may need to contact the support services for your other programs to ensure compatibility. If you anticipate a conflict with other Sentinel RMS License Manager versions please contact your local support department for assistance BEFORE installing. There appears to be multiple version of the Sentinel RMS License Manager installed, is everything okay? Different versions and customizations of Sentinel RMS License Manager are used by many software programs (i.e. RISA or Eagle Point). Please review all programs installed on your designated license server for compatibility with Sentinel RMS License Manager 9.2.1 before proceeding as this WILL over install the currently installed version. Can I upgrade my Tekla Structural License Service while my existing licenses are in use or commuted? It is our recommendation that the license server is upgraded when licenses are NOT in use or commuted. In most typical scenarios this will avoid the need for a reboot of the server but we CANNOT guarantee this as the install may try to replace a file dependency that is in use by another process. My License Server Manager is showing that we are using more licenses than we have but all assigned to one user, how can we fix this?